This IBM® Redpaper™ publication describes IBM Spectrum™ Scale, which is a scalable, high-performance data and file management solution, built on proven IBM General Parallel File System (GPFS™) technology. Providing reliability, performance and scalability, IBM Spectrum Scale™ can be implemented for a range of diverse requirements. This publication can help you install, tailor, and configure the environment, which is created from a combination of physical and logical components: hardware, operating system, storage, network, and applications. Knowledge of these components is key for planning an environment. However, to appreciate potential benefit first requires a simpler understanding of what IBM Spectrum Scale actually provides. 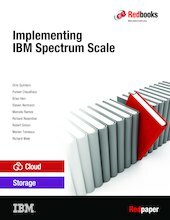 This publication illustrates several example deployments and scenarios to demonstrate how IBM Spectrum Scale can be implemented. This paper is for technical professionals (consultants, technical support staff, IT architects, and IT specialists). These professionals are responsible for delivering cost-effective cloud services and big data solutions, helping to uncover insights among client data and be able to take actions to optimize business results, product development, and scientific discoveries.